Rentometer Pro: Is It Worth It? How Useful is Rentometer... Really? If you've ever wondered what houses and apartments are renting for in a given area – whether you're looking to rent a property yourself, or you're looking to buy a rental property as an investment – you may have stumbled across a free online website called Rentometer. 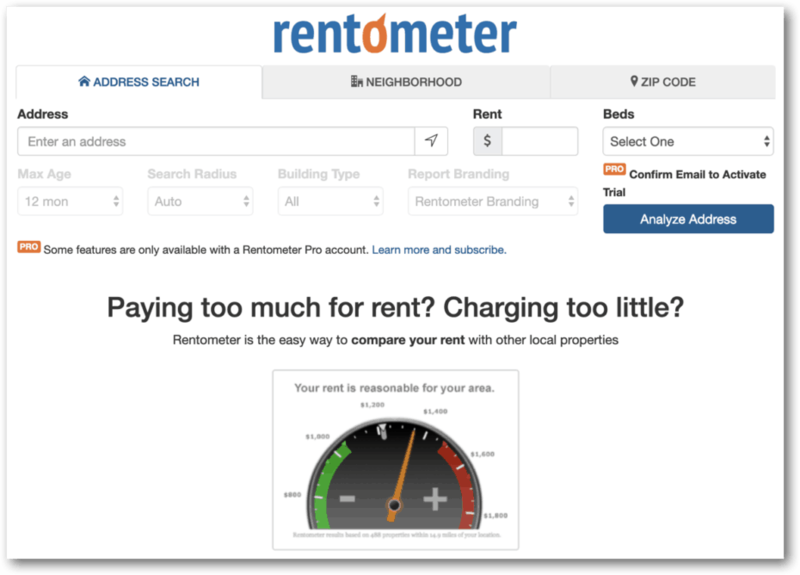 Rentometer is a site that gives users an estimate of what rent prices are in the nearby vicinity of a subject property. You can simply enter a property address, a dollar amount for monthly rent and the number of bedrooms in the rental unit. 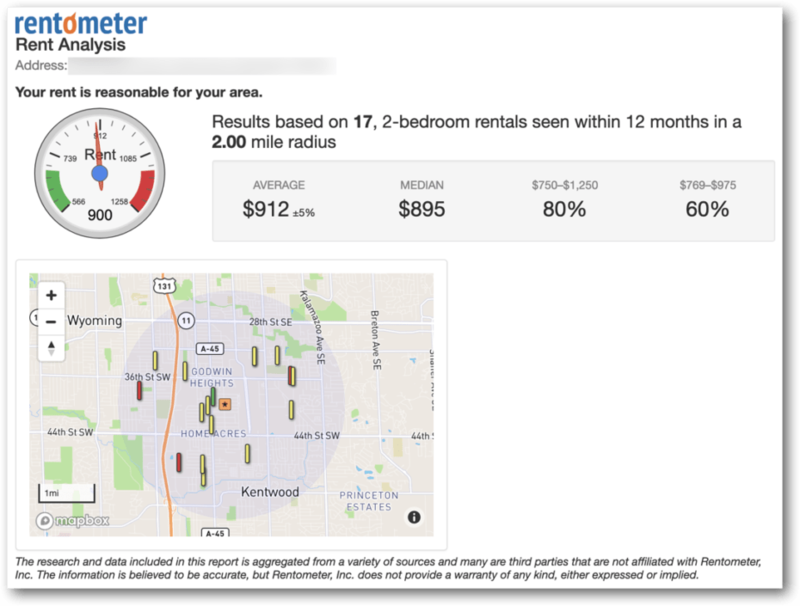 Rentometer will compare your data with similar rental listings in the area and display some numbers and helpful visual aids showing how your rent amount compares to similar properties in the area. I remember back when I bought my first rental property, I had this site bookmarked. At the time, I didn't know any other fast and easy ways to find out what the average rent prices were in the neighborhoods where I was looking to buy, so I referred to it constantly. With such a simple interface (and a friendly little gauge to indicate how my property compared with others in the area) and the fact that it was FREE, it was hard not to love this thing! My realtor sent me a handful of properties to look at, along with his rent estimates for each one. After checking each of the addresses on Rentometer, I found that according to the almighty rent gauge, my realtor's estimates were WAY higher than what Rentometer was telling me. Okay… so who was I going to believe? My Realtor (the guy who desperately wanted to sell me a property): He wouldn't inflate the numbers, would he? Rentometer (the website that only asked for 3 pieces of information, and I had no idea where the data was actually coming from): Could I really depend on the results it showed me? How current and reliable were their sources of information? Whatever rent price I used in my analysis would be a very important question to think about. After all, this projected rent amount (whatever it is) would be a MAJOR factor in analyzing the investment. If I got this number wrong, it could mean the difference between a stellar investment or a terrible one. In order to judge the validity of any number Rentometer spits out, it's important to know where the data is coming from, and whether it's a valid and reliable source of information. In my searches of the company's website, I could find any place where they openly disclosed where their data comes from. 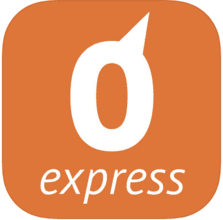 I found this disappointing but understandable (after all, it is a proprietary service – and they're providing it for free to most users). Though we don't give out specific names of our sources, Rentometer collects rental listing data and rent data from a variety of sources including: bulk syndicated data, our proprietary rental data survey, and user generated input and listings of rental data. New data is added every day including new records and updates of existing records as they become available. Our data coverage is national. Our volume of data is proportional to the volume of rentals in any given market. Urban areas and metropolitan centers tend to have more data because there is greater rental activity and density. Suburban and rural areas tend to have less data because there is less rental activity and rentals are dispersed over a larger area. We collect data on a daily basis from all across the country. Most of the data is listing data, so it reflects asking rent for the most part. We do have some landlords and property owners providing actual rent data, however, that is relatively small compared to listing data. Also, we only use the most recent data for a specific rental. So, over the years, we may have picked up 3 or 4 listings for a particular rental, however, we only use the most recent rental in the analysis. So… while we still don't have much clarity on where specifically these numbers are coming from, it sounds like most of it is being aggregated from public listing data, with a very small segment of it coming from individual landlords and property owners who submit their data manually. The only downside to pulling this information from public listings (again, IF that's where it's actually coming from) is that public listings only represent what the landlord is hoping to get for their unit, not actual rent prices that are being paid. Rentometer may be the easiest way to find what rent prices are in most markets, but how reliable is the information? Can you really plug in three pieces of information and have 100% confidence in the numbers it gives you? The biggest problem with Rentometer (especially the free version) is that it's a very, VERY oversimplified version of reality. This isn't a lot to work with. While each of these items does have a big impact on what a property can be rented for, it still leaves out A LOT of important information that needs to be accounted for if you want an accurate, reliable reading. Pets Allowed – Yes or No? While some of these things (namely, the number of bathrooms and property type) actually CAN be evaluated with the Pro version of Rentometer (which currently runs $29/mo or $199/yr), it's still just a high-level overview of the area, and doesn't offer much clarity on the specifics of any single property. 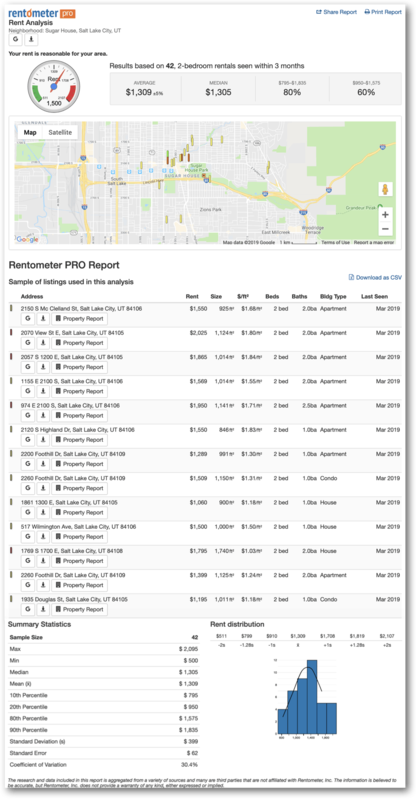 If you want to drill a few layers deeper and find more supporting information on what rent prices are in your area, Rentometer Pro may be worth considering. 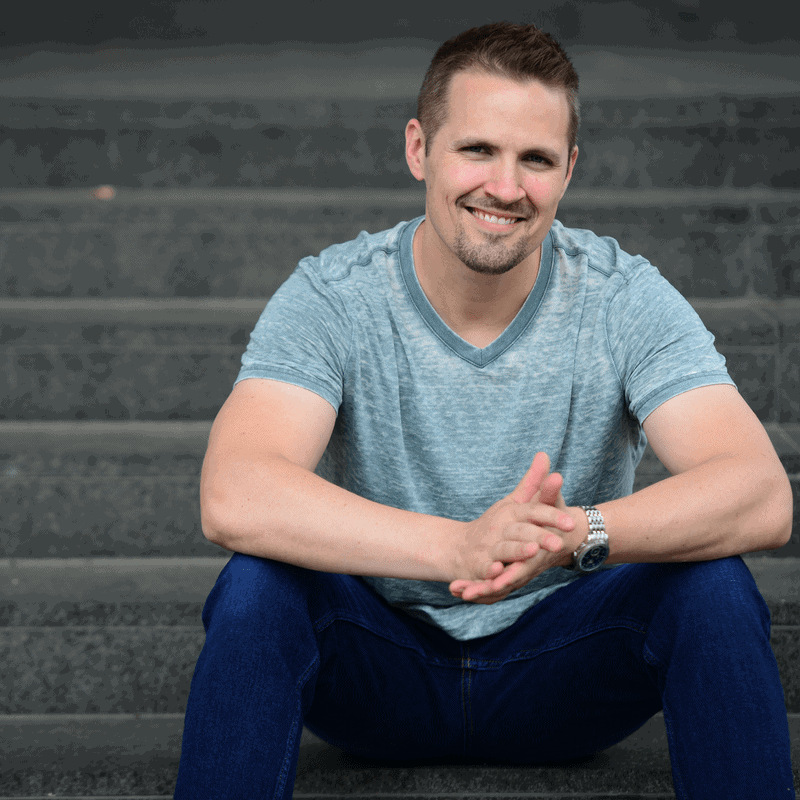 There are several features you'll get with a pro account that aren't available with the free version of the site, but in my opinion, just a few of them are actually worth noting. The Rentometer Property Report goes much further than showing a simple gauge and map of the area. This will provide you with much more relevant detail on each property. Granted, most of this stuff is available for free online (or through other paid services), but if my primary objective was to evaluate and purchase a rental property, there are a few things I think were particularly useful from this report. These things can directly impact the analysis of a property, and potentially affect an investor's decision on how much to offer when purchasing a new rental. 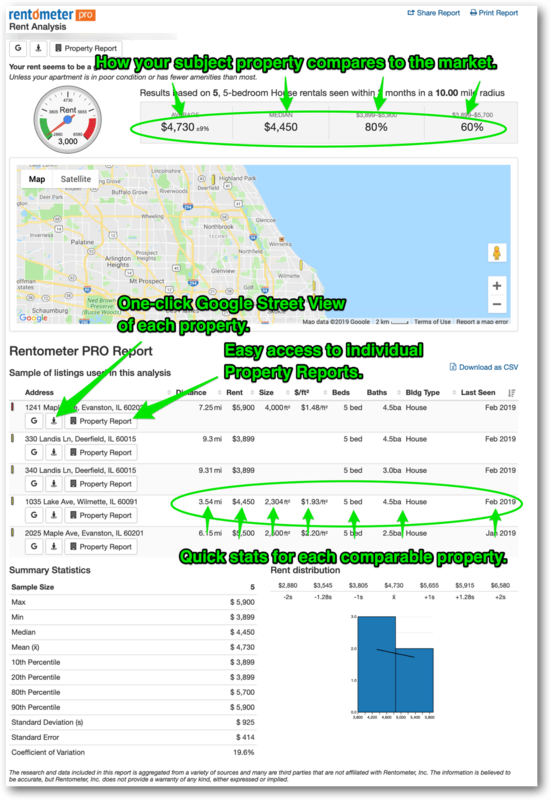 Of course, there are many other places where you can get this data – but Rentometer Pro does package everything into a neat little package in these Property Reports. 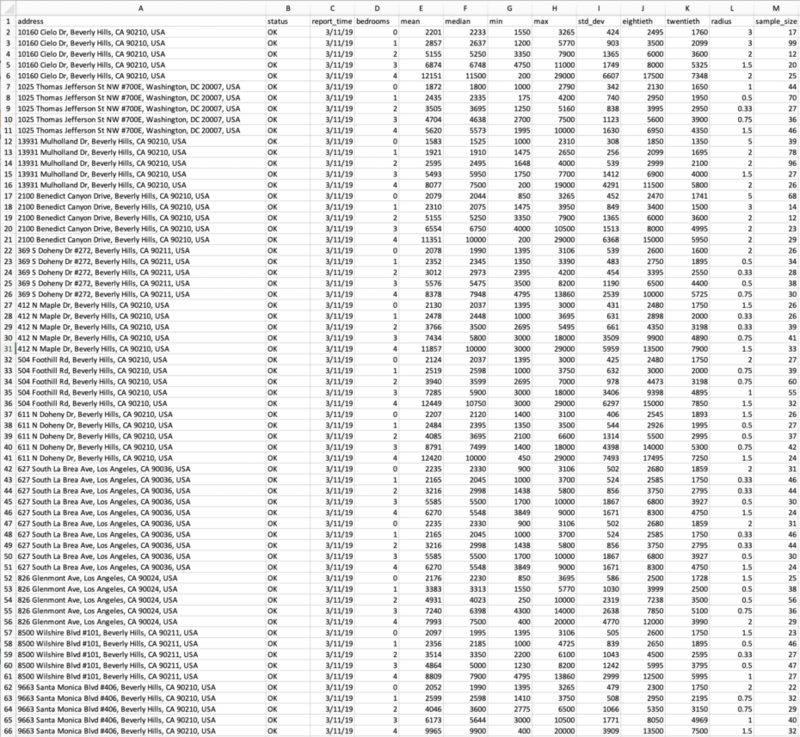 I did find in a few instances that some of these numbers came back as “unknown” (including two of my own properties, which do have a long history of being rented out… so I'm not sure why the data was missing), which was a little frustrating. I'm not sure why these numbers don't always come through… but when they do, it's pretty helpful to see all of this information in one place. 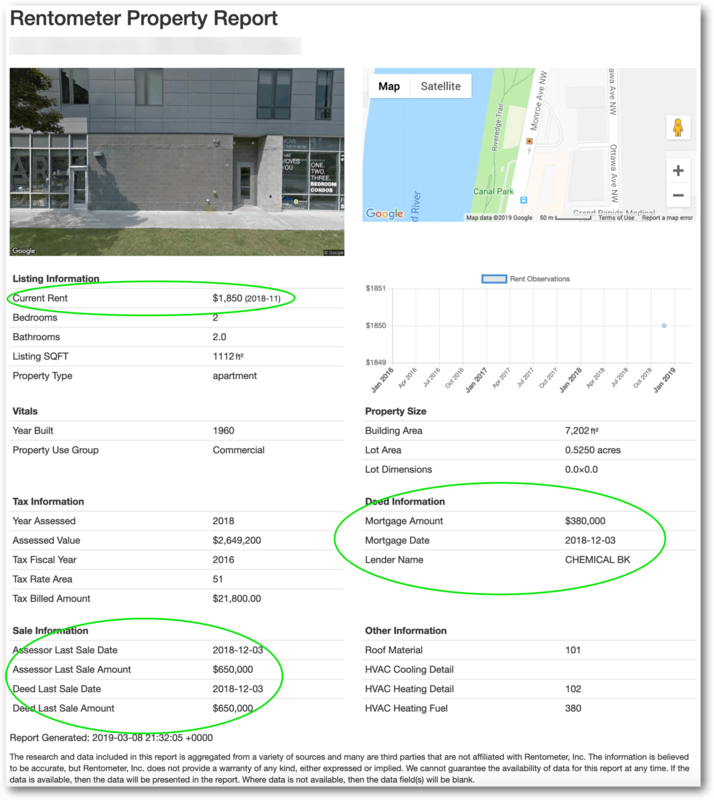 This is a quick way to see a MUCH more detailed view of how your subject property compares to other listed rentals in the market. Keep in mind, with Rentometer Pro, you can specify how far back the data should go, how large the geographic radius should be from your target property, and you can even use your own custom branding (if you have a logo you'd rather include on your reports instead of the Rentometer branding). 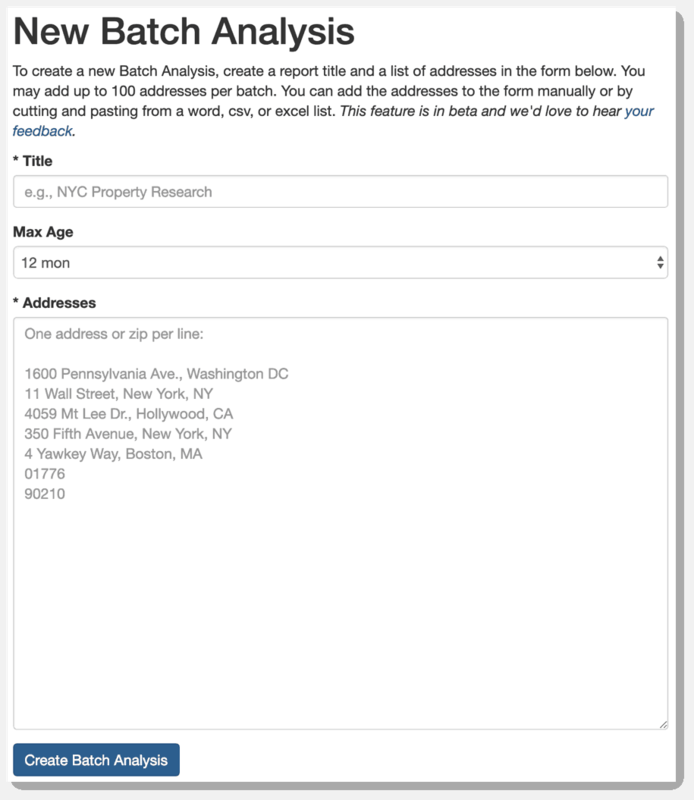 The Batch Analysis tool is designed for users who need rent statistics for A LOT of different properties (and they don't want to run each individual property through the system manually). For example – if you own a large portfolio of rentals and you want to pull comps for each one (but you don't want spend hours doing them one-at-a-time), you can easily paste ALL of these addresses into this field and generate a bulk report for each one. The Batch Analysis function will give users basic rent comp information (i.e. mean, median, max going rent, etc.) for the whole list – and it will show multiple scenarios for each type of bedroom count. When the report is finished, you can simply download a .csv file and play with the data to your heart's content. Now, suppose you don't have one specific property in mind, but you do have a neighborhood or zip code nailed down where you'd like to pursue new opportunities. With a Rentometer Pro account, you can generate reports based on these wider areas. These reports will look very similar to the Rent Analysis reports, with the most notable difference being that it's outlining comparables by neighborhood and zip code, rather than basing it on one specific property profile. In case you weren't aware, there are a couple other creative (and somewhat random) ways to put Rentometer to use. If you've already exhausted every other listing platform on the internet and you're looking for yet another free place to list your rental on the market, Rentometer has a place for that! The listing format isn't particularly pretty or outstanding, but it does make your property stand out a little bit more for anyone who is searching for properties on the Rentometer website. I'll be honest though… I spent several minutes trying to find where rental listings were posted on the Rentometer website, and I couldn't find a single one. The best I could come up with was their Classified section, which didn't include a single listing, but was FULL of random Craigslist-like ads for local business and services. So how useful is this feature of the site? By my assessment, it's not worth writing home about. Why would you want this on your website? Well… I guess that's something only you can answer, but you know who you are. If you need a quick, idiot-proof way to offer rent prices by zip code, Rentometer's got your covered. And lastly, Rentometer also has an app, available for iOS devices (at the time of this writing, it doesn't appear to be available on Android devices yet). As you might expect, it's free, and there's not much to it. Just enter in an address, rent amount and the number of bedrooms, and it'll tell you where your unit stands (according to their numbers, anyway). It's pretty simple and easy to use… just like the original website. Getting an accurate read on what rent rates are is SUPER important, and unfortunately, it'll never be quite as simple as plugging in a few key pieces of data. Property managers have a huge breadth of experience in most neighborhoods of town, and if anyone is familiar with what properties are actually renting for (along with the specific characteristics of each property), these people will know. Whenever there's a truly great idea being implemented on the internet, you can be sure that others are in the same space, doing pretty much the same thing. If you're looking for some alternatives to Rentometer, here are some other options out there at the time of this writing. Part of why Rentometer has such a huge following is because of the fact that it's FREE (at least, for the first few searches, before you have to sign up for a free trial of their Pro account). Here are some other websites that offer a similar service, free of charge. Ziply: This one allows you to specify the number of Beds, number of Baths and Square Footage. With the paid version of this service, you can also see the vacancy rate in the area and the renter density. My Rent Rates: This one is very similar to Rentometer, in that it allows you to list the address, rent amount and number of beds, but nothing else. Zillow Rent Comp Estimator: This one also allows you to specify the number of Beds, number of Baths, Square Footage, and Comparables (and as a side benefit, you can also list your rentals for free on a very large platform with a huge reach). If you're someone who really needs to get a more accurate and reliable read on the market, you might consider paying for one of these higher-end alternatives. RentFax: With several different pricing options available, the Rent Radar report will include a very comprehensive look at the stability of the market, the approximate rent range of each property, and a lot of other enlightening data that you won't see from the free services listed above. RentRange: Another ultra-comprehensive reporting system that includes a RentRange estimate, details about market trends by bedroom and type, comparable rental statistics and more. It also has an online rent collection too (similar to Cozy) that could prove useful to many landlords and property managers. How Useful is Rentometer… Really? So with all this in mind, can a free (or even a paid) tool like Rentometer serve a useful purpose? Even though Rentometer may not give you a laser-accurate, guaranteed number you can bet your life on, it's still a helpful starting point for a number of reasons. 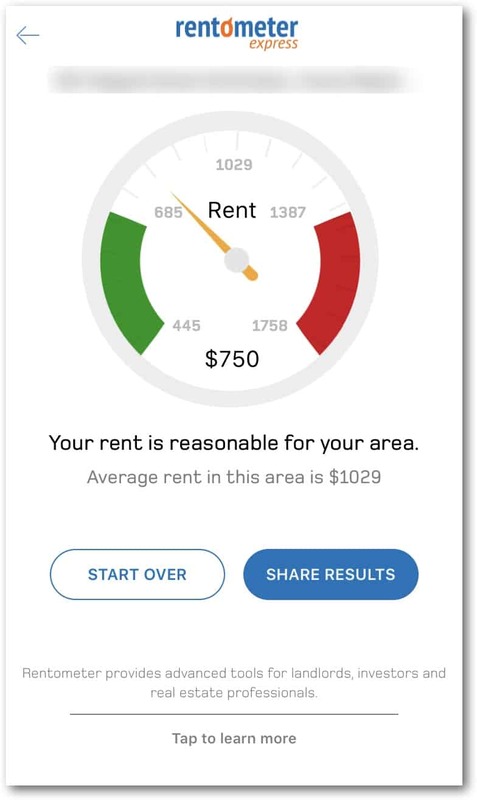 If you're looking in a new market, neighborhood or zip code and you're not intimately familiar with what normal rent rates are, Rentometer is quite useful at showing you what the “range of acceptability” is from other landlords and property managers in the same area. Of course, you could easily hop on Craigslist or Hotpads and pull up a few similar rental listings – but if you're looking for a quick and easy sampling of the market, it's hard to beat what Rentometer brings to the table. I mean, honestly – if it takes 5 seconds and its free, why not give it a whirl? At the end of the day, it's a free tool to have in your toolbox. It's not worthless, but it's also not the same as having feet on the street and getting an educated opinion of someone who knows all the dynamics at work in your market and with your specific property. Have you ever used Rentometer? What did you think of it? Let us know your experience in the comments below! Great in depth study of Rentometer. I completely agree. It’s a free tool so it doesn’t hurt to get a ballpark estimate. But don’t rely solely on that (or any one tool for that matter) if you are making a major financial decision. Thanks for sharing! Your blog post is awesome – a great resource. Thanks for the link to my article! Much appreciated! Thanks for putting together such a great resource! Keep up the good work.